Left to right: Alison Baverstock, (Project Director); Wendy Woodley and Wendy Morris (KU Big Read Library Liaison) and Laura Bryars (Project Administrator). KU has announced the six shortlisted books for the Big Read project and they are now available to borrow at the university libraries. 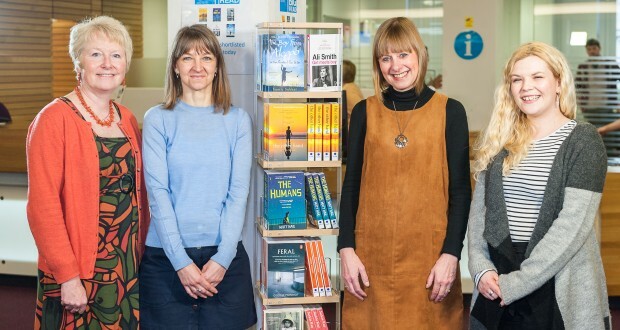 The Big Read team have worked with the KU IT department to develop an algorithm that will select the winning book from a list of suggestions made by students and staff. “All the data throws out a ranking of which title would be the most interesting, so that is how we have decided,” said Laura Bryars, The Big Read project administrator. The six shortlisted titles are: The Other Hand by Chris Cleave, The Humans by Matt Haig, Girl Meets Boy by Ali Smith, Red Dust Road by Jackie Kay and Feral by George Monbiot and The Boy from Aleppo who painted the War by Sumia Sukkar, who graduated from KU in 2013. Laura Bryars said the project has caught the attention of the publishing industry because of how innovative the selection process is. The new Big Read title will be announced at the end of April and the committee, consisting of 15 students and staff, is currently reading and deciding on a book. The winning book will be printed in a special edition with the KU logo and a letter from the Vice Chancellor and a former student participant. Last year’s book was chosen by the Vice Chancellor but this time around students got to have their say through filling out questionnaires provided by the university. Laura Bryars said: “The only real concern that came out through the questionnaire was actually that last year’s book, [About a Boy] was based in the nineties and I think that is purely generational. “We have taken that into the consideration this time around in the selection process,” Bryars said.